There are many versions of the recipe for Baghdad (also known as 'Turkish') eggs. This one sits the eggs on cool Greek yogurt that has been spiked with garlic and drizzled with spicy, sizzling butter. Eat with these minty pitta crisps. Preheat the grill to high. Fill a deep frying pan with water and bring to the boil. Cut one edge of each pitta and prize each layer apart. Place the cut side up on a baking sheet. Mix the oil with the mint and chilli and spoon over the pitta. Place under the grill for 2-3 minutes until golden and crisp. Break up and scatter with salt. Mix the yogurt with the garlic and season with salt. Divide among two bowls. Once the water in the frying pan is boiling, set the heat to low and wait until it is barely simmering again. Break four eggs into the pan so they keep apart. Cook for 3 minutes so the yolks are still soft. Lift each one out with a slotted spoon and drain the underside with kitchen paper. While the eggs are poaching, heat a frying pan over a high heat with the butter and paprika and cook until it starts to go slightly brown and nutty. Add the lemon juice, watching out as it will splutter. Place two eggs into each bowl of yogurt. 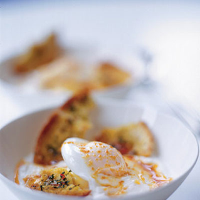 Drizzle the butter over the egg and yogurt. Serve with the pieces of minty pitta crisps. A ripe Chardonnay has enough fruit sweetness to not be overawed by cream and egg protein.